InternFeel: Hello Shreya, Pleasure to meet you. Please tell us about yourself. Shreya: I am a second year engineering student studying Computer Science at the LNM Institute of Information Technology, Jaipur. I am a very calm and patient person. I believe that hard work is the key to success. I have always been very hardworking and ambitious. My teachers and colleagues have always praised me for my tenacity. My interest includes software development and programming. My other interest lies in mathematics and chemistry. I am good at grasping things easily. I always desire to learn more. In extracurricular activities I like to dance, sing and travel and I am a trained Kathak dancer (done BA i.e. Bachelor of Arts in Kathak). I believe that one should actively participate in both academic and non-academic activities. Tell us about your training in short. 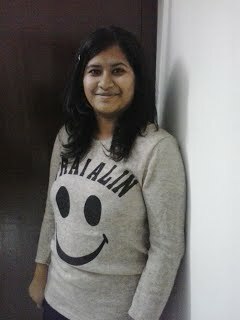 Shreya: I got a chance to undergo a summer training at Hewlett Packard (HP) for a month from 6th June 2013-6th July, 2013. Though it was an unpaid training, I got a chance to learn a lot and gain knowledge. I also got a certificate from HP regarding the same. Shreya: In the month of April, I applied at HP. My seniors at LNMIIT told me about this training. The other website which I refer is Internshala. IF: How can students apply for this? Shreya: Students can apply by registering themselves at “www.hpesindia.com” and then choosing the course and duration of the training period. Shreya: Selectors want the applicants to be enthusiastic enough to learn and gain knowledge and discover new things apart from their regular curriculum and the applicants must have the desire to learn more and more. I was always active in cultural, technical activities. Shreya: Before joining the training in June, 2013 I worked on programming skills to strengthen my basics and develop a better understanding of course during the training period. IF: Any common mistakes which you feel students should avoid while searching and applying for training? Shreya: Students while applying for the training or internship are not aware of which field they are interested in and just for the sake of doing it, they apply it. So students must apply accordingly. They should also make their resume and cover letter, specifying their area of interest needed for applying in internship and training. They should have a clear vision about their interest. Students must also keep checking other colleges’ and companies’ websites to keep them aware about the opportunities. IF: So Shreya, could you please highlight us with what work/research project you carried out during the internship period? It’s application in near future and your work in it? Shreya: I worked on a project Chat Server using core java using the concepts of multithreading, synchronization, i/o exception handling. The server file starts the connection and the client file serves as the user. This chat server allows chatting on same computer only. Shreya: I had to attend the training daily from 9am-1pm consisting of theory and lab sessions. I got many friends over there and my teacher was very helpful and guided me throughout my training. Shreya: There was no problem of food and accommodation as I live in Jaipur. But students outside Jaipur had to face a problem of accommodation. Shreya: My guide was very interactive and highly intellectual. He helped me understand all concepts and was highly motivational throughout the training period. Shreya: First of all, I would like to thank my parents and grandparents for being so supportive and encouraging me. I am very grateful to my guide who throughout the training period motivated and helped me a lot. Last but not the least, I would like to thank all my friends for their help and support. Shreya: During the course of the training period, I learnt a lot of new concepts and acquired a lot of knowledge which would be helpful in future. Shreya: I want to work in Software Development and this training would be helpful in the near future. Shreya: It is a great initiative of InternFeel to get students learns from the experience of others and become aware about the internships available. IF: So Shreya, we are at the end of the interview. From the entire team of InternFeel, we thank you for taking out your time and sharing your experiences for everyone and we wish you best of luck for all your future endeavors. Shreya: Thanks you so much InternFeel. I am very grateful to you for giving me a platform to share my experience with others. I am very happy after giving this interview.